Noted evangelist Ray Comfort has decided that atheists don’t really exist. Note the way he words it: “There can be no such things [sic] as an atheist.” He’s not just saying that atheists don’t exist, he’s saying they can’t exist. Seeing as I am one, I was curious to know why Mr. Comfort doesn’t believe in me. So I read it. Comfort is the same guy who once did a video with former actor Kirk Cameron about why the banana is “the atheist’s nightmare” – because it’s conveniently shaped for human hands, it has a non-slip surface, has a biodegradable wrapper, and other nonsensical reasons. Obviously, it must have been designed by God. This is ridiculous on a number of levels. First off, the banana he describes is one of a number of types of banana, and others don’t have the same qualities. Bananas don’t grow all over the world, which you’d think they would if God had designed them to be human food. The coconut was presumably also designed by God but grows in an inconvenient location and the wrapper is much more difficult to get through. There are lots of things that grow on plants that have many of these qualities but are poisonous. But most importantly, the banana he describes was not designed by God at all; it is the way it is because of hundreds of years of domestication – we keep and cultivate only the plants that grow the bananas the way we want them. While this is undeniably true, it’s also completely meaningless. An atheist is not someone who claims to know for a fact that God does not exist, he’s someone who believes that God does not exist. 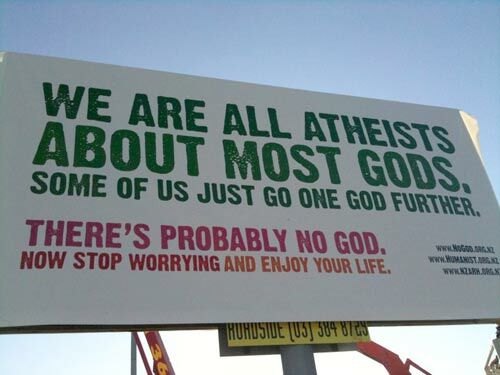 Even the people who put atheist messages on billboards and buses phrased it as “There’s probably no God.” Not “unequivocally”, not “definitely”. “Probably”. I don’t need to know everything about everything in order to believe this. Can I prove it? No, but I’m not trying to and no atheist has ever (seriously) claimed to be able to. You see evangelists claiming “proof” of God all the time, but none of them has ever actually provided any. During Bill Nye’s debate on evolution with Ken Ham, each was asked about what would make them change their minds. Nye responded as any skeptic would – if there was actual evidence, I’d change my mind. We would need just one piece of evidence, we would need the fossil that swam from one layer to another; we would need evidence that the universe is not expanding, we need evidence that the stars appear to be far away, but they’re not. … Bring out any of those things, and you would change me immediately. And so, as far as the word of God is concerned, no one’s ever going to convince me that the word of God is not true. So if I were to ask Mr. Ham whether it’s possible that he’s wrong, it’s pretty clear what his answer would be: no, it’s not possible. If Mr. Ham asked me, however, I’d happily admit that it’s possible I’m wrong. It’s definitely possible that there’s a God who created the universe 6000 years ago and then decided to leave no incontrovertible evidence of his existence and make the universe look exactly like it would had it been created in a big bang 14 billion years ago. But I don’t think so. This entry was posted in Religion, Skepticism on October 27, 2014 by Graeme. Yes, the Texas Republicans are officially opposed to teaching kids how to think critically. They want their children to blindly believe whatever they are told. This is a blatant ploy to gain votes from the strongly religious, of which Texas has a great many. If from the time a student was born, he has people telling him that the Earth is 6,000 years old and humans and dinosaurs were around at the same time, we definitely don’t want his teachers to start “challenging the student’s fixed beliefs” by introducing stuff that contradicts that, like geology or paleontology or pretty much any other branch of science. If mommy and daddy tell you that evolution isn’t true and God did it all, well we wouldn’t want to “undermine parental authority” and have Junior go and start thinkin’ about it, now would we? The fact that this is the Texan governing party’s official position and they want to make this law makes me weep for the children of Texas. One reason I could never live in Texas. Well, this and the scorpions. This entry was posted in Religion, Skepticism on July 20, 2012 by Graeme. I recently heard a Christian song called “Oh, What A Reason”. When the song began, it sounded to me like many other Christian songs, and I kind of tuned out. Then the line “There’s nothing in this world worth living for” caught my attention. This didn’t sound like a lyric from a Christian song, more like some depressing emo band. Now, I’m an atheist, but I’m not one of those uppity atheists that think that Christians are all moronic brainwashed sheep. So be aware that when I question these lyrics, I’m not questioning them because they refer to God. I’m questioning them because they have implications about the Christian faith that I cannot imagine are true for the vast majority of Christians. Many Christians believe that their faith in God is the most important thing in their life, and that’s fine, I get that. But that’s not what this song says. It does not say that God is their favourite reason to live, or a very important reason, or even the most important reason. It says that God is the only reason to live. The only reason. “There’s nothing in this world worth living for / it only leaves you empty and longing for more” – is that really what devout Christians believe? That their family, their friends, their career, they’re all meaningless? Real happiness “can’t be found”? At all? Ever? If this is really how the songwriter feels feels about his/her life, well, quite honestly I feel sorry for them. Personally, I believe that real happiness can be found, because I’ve found it. I have many reasons to live, and that’s without faith in God. Maybe whoever wrote this song should try give atheism a try. This entry was posted in Religion on July 29, 2009 by Graeme. My letter to the editor was published in today’s Spectator. I’ve had one other letter published in the Spec, and one in the Flamborough Review a few years ago too. This entry was posted in Religion on May 4, 2009 by Graeme. Thousands of biologists have confirmed on the micro scale that organisms change over generations. On the macro scale, these observations have been confirmed in the fossil record, which shows both diversity and similarities among species that indicate a common ancestor. This has led to the theory of evolution. Other scientific theories include the germ theory of disease and the theory of electromagnetism. Creationism is not a scientific theory. It is philosophical speculation that an intelligent being created the universe. It cannot be tested and has no data to support it. As such, it has no place in science classes. Another left-brain-thinking scientist tries to tell us to look at the beauty of creation as one big accident. Maybe the building blocks of life were created by God. Since we don’t know for sure how that happened, I have to admit that the idea is at least plausible even if I personally don’t believe it. Maybe God created the first seeds of life and then allowed evolution to take it from there. Look at that, we’re both right! Everybody wins! This entry was posted in Religion on April 30, 2009 by Graeme.